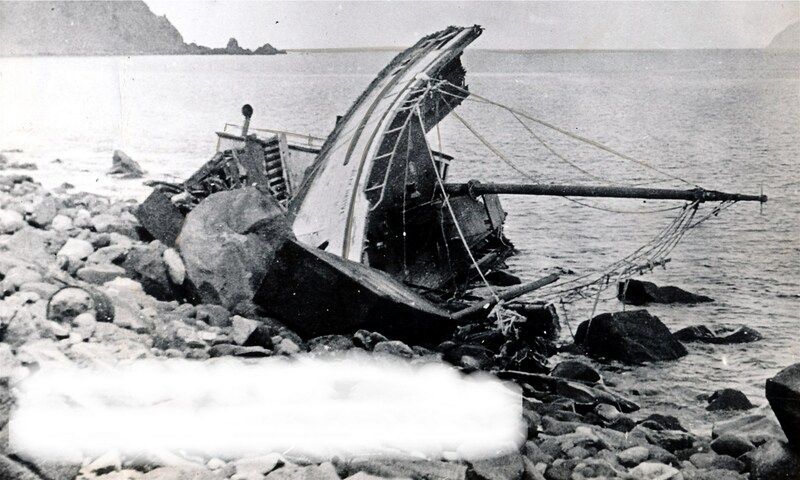 CAPE CLEAR (1927) The American gas screw Cape Clear stranded Saturday February 12, 1927 at 5:00 a.m. on the northeast side of Langora Island and became a total loss. She left Ketchikan the day before bound for the fishing banks of Queen Charlotte Island with five crewmen aboard. Heavy fog, a dark night and a strong current may have contributed to the accident. The captain and owner, Ben West of Seattle, calculated his distance from shore was seven miles when the Cape Clear stranded. The crew all survived, but the vessel valued at $7,000 was a total loss. CAPE HORN PIGEON (1897) The Cape Horn Pigeon was lost during the whaling season of 1897 at Hakodate, Japan with 900 barrels of sperm oil aboard which had been accumulated in the Arctic. It is often listed as lost in Alaskan waters. CARJIE (1977) The 31 foot vessel Carjie ran up on the rocks and was destroyed October 23, 1977. CARRIE AND ANNIE (1907) The 95 ton schooner Carrie and Annie stranded and was lost in Shanta Bay, Okhotsk Sea, Siberia on August 30, 1907. CENTENNIAL (1906) The 324 foot 2,075 ton steam ship Centennial disappeared with 38 crewmen aboard after leaving Hakodate, Japan February 24, 1906 bound for San Francisco. Wreckage of the Centennial was spotted by the steamer Pennsylvania in late March of 1906. The Pennsylvania was travelling from the Philippines to Port Townsend, Washington. The Centennial was found abandoned six years later frozen in the ice off Sakhalin Island in the Sea of Okhotsk by Russian explorers. There were no lifeboats aboard and no sign of the crew of 38. Lost from the Centennial were captain B Gilboy, 1st officer James McCarron, 2nd officer Brent O Lee, 3rd officer Fred Richardson, chief engineer J Flanagan, 1st assistant engineer Owen Hickey, 3rd assistant engineer O P Jensen, stewardess N Eloise Wagner, carpenter John Garrity, sailor T Wynberg, sailor W Ecklund, sailor Jacob Miller, sailor L Olsen, sailor A E Sandberg, sailor John Kamp, sailor Carl Hellman, oiler R DeRoseville, oiler C Keene, oiler J McGinity, fireman Michael Norton, fireman J Legarpu, fireman James Godfrey, fireman S Wizera, fireman James Norton, fireman N Murphy, coal passer William Malone, coal passer George Lescano, coal passer Joseph Fernandez, coal passer J Asarila, coal passer A Allen, coal passer Thomas Moore, chief steward E J Smith, chief cook A Rogers, assistant cook S Manuel, messman H Carlton, messman George Ford, watchman S Middel and waiter H Bohm. CHALLENGE (1919) The American gas screw Challenge was lost at winter quarters at Bernard Harbor, Coronation Gulf, Northwest Territory, Canada in the spring of 1919. The 39 ton vessel was built in 1885 and owned by Leo Wittenberg and James Crawford of Nome. “The vessel froze to the bottom during the winter and when the overflow came in the spring she filled with water and sank and finally broke up in the ice.” The Challenge was worth $4,000 and uninsured. CHIL BO SAN NO 1 (1986) South Korean freighter Chil Bo San No 1 disappeared after leaving Hokkaido Japan bound for Alaska February 17, 1986. An extensive search found no evidence of what happened to the freighter or her crew of 18. COLUMBIAN (1906) The White Pass and Yukon steamer Columbian caught fire and was completely destroyed September 26, 1906 at Eagle Rock between the mouth of the Little Salmon River and Tanatalus. Six died as a result of the fire and subsequent explosions. The vessel was traveling downstream on the Yukon River when a fire ignited several tons of black powder destroying the steamer. Among those lost were first mate Joe Welsh (41) of Victoria BC, fireman Edward Morgan (24) of Victoria BC, deckhand John Woods (25) of England, deckhand Carl Christianson, deckhand Phil Murray (19) of Seattle and deckhand W.T. Smith. Passenger E.E. Windstandby, a miner from Dawson and purser L. C. Cowper of London survived. All 200 tons of freight on board including 156 tons of merchandise and 21 head of cattle were lost along with the Columbian. COMEDIAN (1961) The 12 ton 38 foot wooden gas screw fishing vessel Comedian foundered April 16, 1961 off of the coast of Mary Island. CONCORDIA (1902) The 110 ton schooner Concordia was wrecked 10 miles west of Virgin Rocks on April 27, 1902. CONSTANTINE (1898) The river steamer Constantine was reported to have broken loose and sank while in tow of the steamer Progresso of South Portland 450 miles off of Dixon Entrance. She was valued at $37,000 with the supplies aboard. A rumor that circulated in Dutch Harbor soon after recounted a schooner captain finding the Constantine adrift and abandoned 200 miles off shore. The schooner captain is said to have salvaged the supplies off of the river steamer.